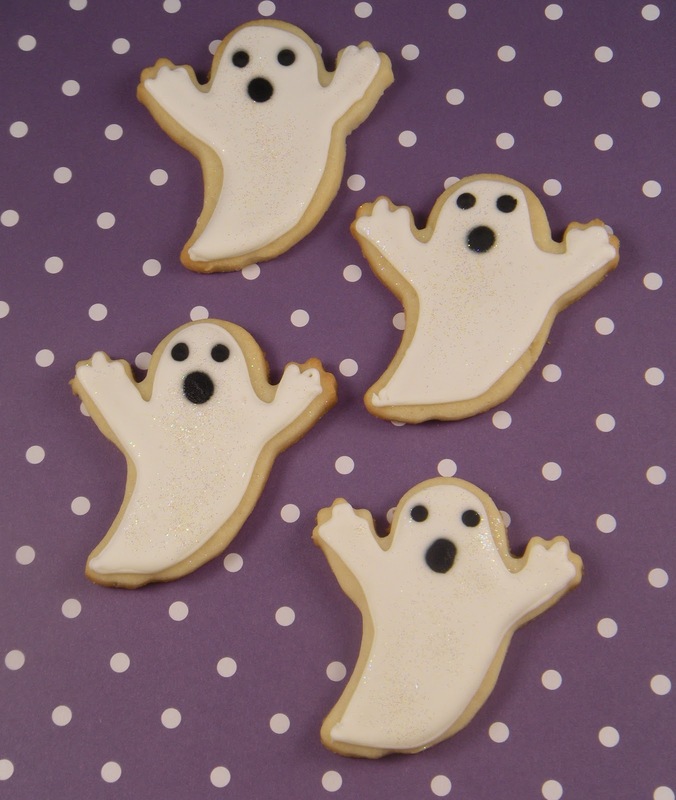 Wouldn't you be disappointed if I didn't make Halloween cookies? I did it rather last minute, and I have to say I am a little sad to not have a group of teenagers around this weekend to cook for and help with costumes. 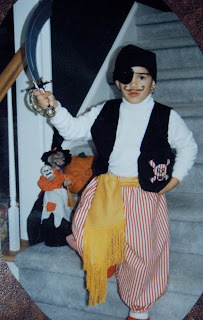 I was truly that crazy, crafty mom who planned the costumes every year. We had some good ones, and lots of great trick or treating memories. It was so fun when the kids were little because I could sort of talk them into costumes. 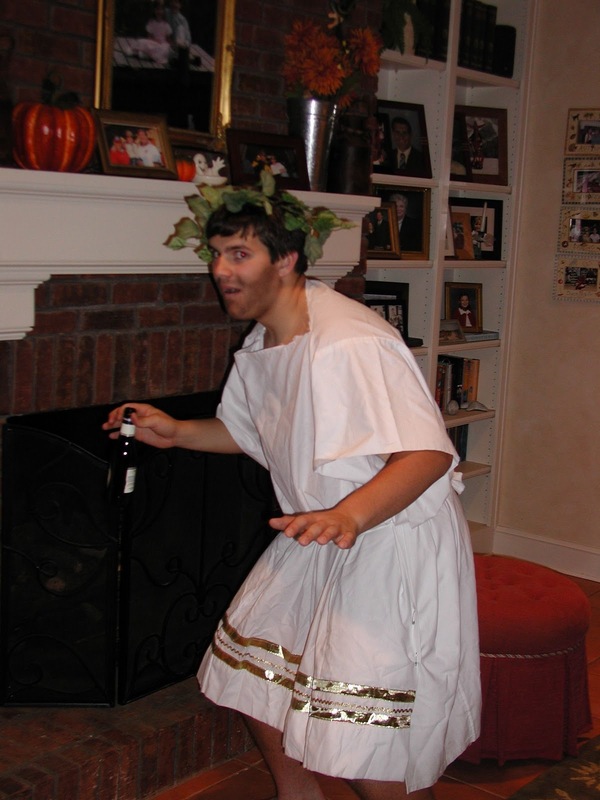 Nic always loved to dress up! My favorite Halloween picture is this one. They are both wiped out after trick or treating, and Nic had been a pirate with those eyebrows and mustache! Christina was only about 6 months old, but she was strollered all over the neighborhood anyway! Christina refused any kind of costume until she turned 2. Then I took advantage of the boy girl thing and made them cowboy and cowgirl. She was all for it because she got boots, and Nic got a gun! Even as teenagers, we would try and come up with great ideas. 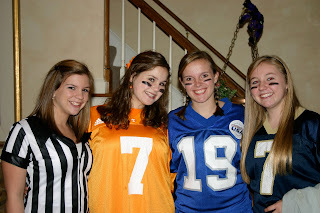 The 50's girl in a poodle skirt is a classic, and one year all the girls went as athletes and ref. Easy and not terribly embarrassing at a coed party. My favorite of Nic was the John Belushi character Bluto from Animal House. Okay, I have embarrassed my kids enough...I probably don't want to know what they are dressing up as this year! 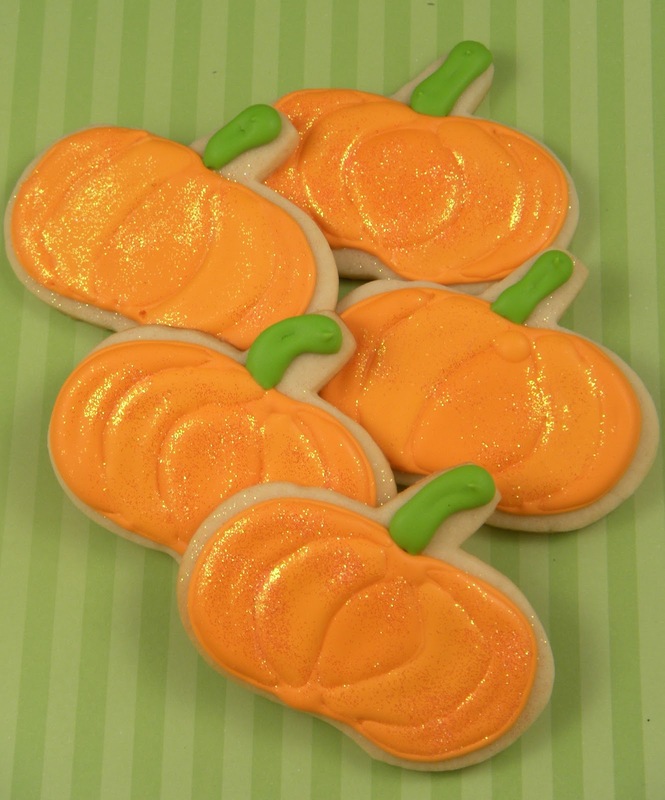 So I didn't do a lot of cookies, but I really like the sparkly pumpkins which might make an appearance at Thanksgiving as well. I used the smaller gingerbread man cutter for my mummies this year, but I think I like them bigger. And the ghosts are just basic, you can't really mess with the simplicity of a ghost. I bought the witches hat cutter this summer, and I like its crooked design. The spider on the web at the blog header are a favorite of everyone. They are large, but they are a show stopper. So hopefully we'll get a few kids here, and hoping you all have a great Halloween! So the last day of wine country was pretty tame. We decided to do a few drive bys to wineries just to get a peek, no tasting. Sebastiani and Ravens Wood are both close to the square in Sonoma, and both will get a real visit next trip. We skipped breakfast and were a little hungry by the time we hit the Oakville Grocery. On the main drag in St. Helena, it is a cool deli, cheese shop, coffee bar and grocery with a great selection of local products. I resisted buying anything because lunch was just a few miles away. Every foodies destination in St. Helena after the Culinary Institute of America, is Gott's Roadside Tray Gourmet. This place rocks! It is jamming with people, and boasts a very extensive menu. It was hard to decide what to order, but we opted for draft root beer, a cheese burger and onion rings for Scott, and a turkey burger and sweet potato fries for me. A $33 lunch, and it was delicious. The burgers were served on an home made egg roll, deep yellow in color. The rings were hand battered and light, and the sweet potato fries were spicy and thin. We devoured a fair share of it. Now to taste wine. Ugh. 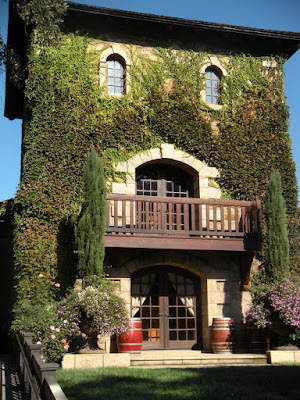 We started at Beringer because we wanted to do the tour and hoped the walk would help us with the full feeling from our large lunch! The caves were very cool, hand dug over a hundred years ago, the casks were antique and the tour guide was full of stories and lore. It was very interesting to learn how a couple of German immigrants made their way. Sadly, Beringer is part of a large corporation now, but thankfully the charm of the caves and gorgeous homes and gardens remains. We knew Beringer wines were readily available, so we opted to do the reserve tasting. Our plan was to take a case of various wines home with us, and then we would get the rest through our new "wine club". We had 3 openings left in our case, so what to buy? We enjoyed the reserve wines here, but maybe because we weren't really in the mood, we just couldn't decide on anything we loved. So we hit the road. We headed to down town St. Helena, and hit Olivier Olive Oils which has had a presence in Williams Sonoma for years. I was curious to see what else they carried and was surprised to see a few WS products there. The staff was really knowledgeable and the store was quite charming. Next we went to Wood House Chocolates. Wow. This is one beautiful chocolate store. It was fun to just look around. I bought a couple of cool Halloween things for the kids and Scott and I split a couple of small pieces. We then headed down the road to St. Helena Olive Oil Company. I really enjoyed this store. They have many tasting areas set up, and I am still thinking about the jalepeno olive oil. It was fantastic. I just couldn't think about bringing back olive oil, and now I am planning my order. I really want their t-shirt which says, Lessen your dependency on foreign olive oils....clever play on words. I did buy an amazing pasta sauce and some great herbs here. Our last winery of the day was V. Sattui. This is a great winery, full of life. There is a cellar room with the barrels aging and a little history. There are gorgeous picnic grounds and a deli, shop and tasting bar. We tasted everything here, no small feat! We had no problem filling up that case, as none of their wines are available retail. I even bought a few other things including an huge salami, like we had when I was a kid. 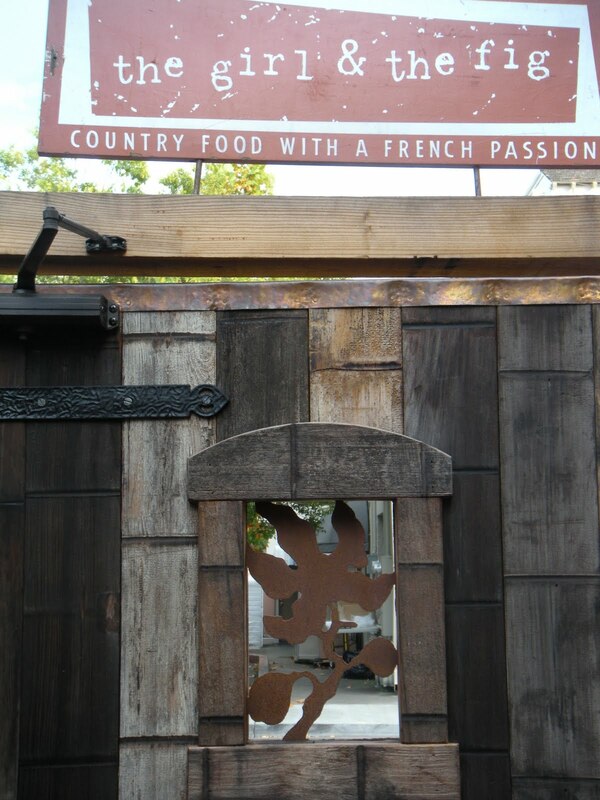 This is a great stop in wine country, and I wish we took our Gott's to go and ate outside here! A quick pass through Yountville to pay another homage to Thomas Keller and Michael Chiarello one more time, and sort of eyeball things to put on the itinerary for the next time. 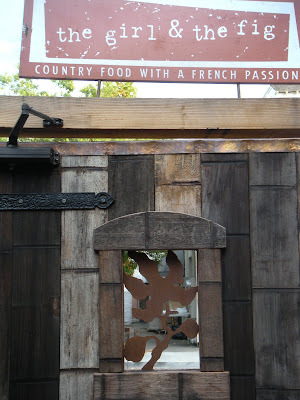 Finally, we also hit up a couple of tasting rooms, and both specialized in small winery labels. We just didn't love them. They have upwards of 40 labels, and you buy 5 tastings at a time, so you can't really get through them. But I think buying at the winery was really the most fun. I am happy to be home, and have been inspired to cook again after all that great food and wine! So, what are you waiting for? So after the first two days of biking, drinking and eating, I called "Uncle". The following morning we headed to Sonoma square for breakfast at Basque Boulangerie. It was only okay, Model Bakery is the standard by which all bakeries in Wine Country are compared. So we then headed to Corner Stone Sonoma. This is an intriguing place. There are various gardens set up with different artists and landscape artists having put their vision in a confined space. Like most art, some of it was bizarre, but one that really stood out was these silver clouds hanging from trees. The clouds were made from chicken wire and really looked like storm clouds. And hanging from the bottom of these clouds were hundreds of crystal baubles. They caught the sun and sparkled in great contrast to the storm clouds. I was intrigued. There were amazing shops full of architectural pieces, garden pieces, lots of artsy objects that were different and distinct. There was a cafe, but since we had breakfast and were looking forward to an amazing dinner, we passed. But they were stoking the fire and it smelled delicious. Of course there is a wine bar but we passed. I know. You have every right to be disappointed in me. We headed back to the hotel, had a little nap, and awoke refreshed, and amazingly, thirsty! We had a few hours before dinner, so we headed to Yountville for some strolling. First stop was Bouchon Bakery. I was so disappointed to find they had a small fire and were not up and running at full capacity. There were no French pastries, macarons, breads etc. I was bummed. But we did buy some caramel corn and toffee (Scott's weaknesses) and a crazy thing called a Thingamajig. I can't remember for sure though. It was a Rice Crispy treat with caramel on top, bathed in chocolate and adorned with a little fleur de sel. Delicious! And no, we did not eat all this before dinner! We had to have a little moment of reflection at the great Thomas Keller establishments, Bouchon, Ad Hoc and French Laundry. Gorgeous settings and all terribly unpretentious. At least until the check comes. I dream of dinner at French Laundry, but Scott would never enjoy it to the degree I would. It is also nearly impossible to get a reservation, unless you carry an American Express Black Card. If you need someone to share this experience, give me a call, I am great dinner company! There is a small shopping center called the V, and we strolled in and out of the shops, there is also a beautiful wine store with tastings and an impressive assortment of wines. Not just the oddball ones, and we'll talk about that later. Behind this little mall is the entrance to Bottega and the store Napa Style. Both are the brainchild of Michael Chiarello. Napa Style was first. I have been ogling over their catalogs for a long while, and in person it is full of charm. It is exactly the type of store someone like me falls for. It is truly designed for the entertainer who loves a home with personality and charm. I could gush about so many things there, but you should look at the website yourself. You know I have been working in a similar type of retail establishment for 14 years, but I cannot lie. This store has so much personality. There is also a wine tasting bar, which was fortuitous. So tasted the selections in Chef Chiarellos winery. We loved a lot of them, and chose a few to take home. We also discovered if you bought his wine there and took it to his restaurant they would waive corkage. So that was a win, win. We did some serious shopping here and had it all sent home for us. I also made my Christmas list. The next day, Scott wanted to go back...what? Yep, he loved it as much as I did! Then to the HIGHLIGHT of the entire trip. First let me tell you about me. I am a blogger, love to cook and bake. I am also addicted to reality TV. I TiVo every Top Chef, including Just Desserts and Masters, Hell's Kitchen, and a few others. I also watch all the Top Chef reruns. I love it. 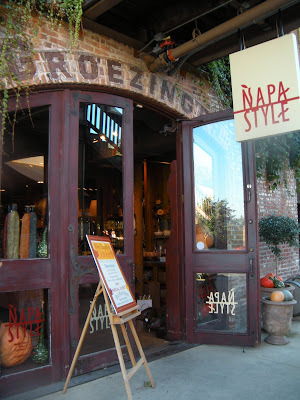 Chef Chiarello of Bottega had a show called NapaStyle on Fine Living which I am pretty sure I have seen them all. He also has a show on The Cooking Channel called Easy Entertaining. This what I love about his vision. It isn't food that blows people away with its crazy components or plating. It is food that brings people together. Food that showcases his heritage (yep, paisano, like me) and his very beautiful home in Napa Valley. The food may seem pretentious to some, but it is simple and beautiful and I love the feeling his shows, his store and his restaurant evoke. I'm a fan, plain and simple. So as we shop in Napa Style the gals tell us that Chef is indeed in town and generally comes to the restaurant when he is. Of course I knew he was in town, because I saw him at the airport. I sort of slunked around the men's room exit, but I missed him somewhere, but I did tweet that I would see him later in the week for dinner! Among my purchases was the Bottega cookbook and they told me he would personalize it for me. Yea! Another for my collection! So dinner... We were seated outside, a gorgeous evening. Our waiter was charming and adorable, named XXXXX from Turkey. Very attentive but not annoying. He was happy we had our Chiarello Vineyards wine and promptly opened it for us. They start you with some fantastic bread and Chef's signature spread, Salsa di Parmigiano. You can Google it, but I have a blog about it that I have been writing for a few months, coming soon I promise. I have found other uses for this delicious spread. Also of note, are the charming copper tumblers. I love these little guys, and I have amassed a nice copper collection. I love the warmth of the color and hope Santa paid close attention to my obsession with these. We began the meal with Monterey Calamari crisped with Arborio Rice Flour and Aioli Nero. The calamari were delicious. The Aioli Nero was basically an aioli with squid ink that made it black and rather tar-looking. It was really delicious, but we laughed and laughed with black teeth and tongues. After being married for 25 years, it was hilarious. On a first date, it could be a deal breaker! Our pasta course was Calabrian Sausage Lemon Ricotta Tortellini with Spicy Brocolli Rabe, Tomato-Pork au jus, and Mostro Oro Olive Oil. There were some tortellini with the sausage which was deep red and spicy. The other tortellinis had the lemon ricotta which was bright and fresh. They were truly delicious. Both of the first courses were ample for sharing. So on to dinner. I hate to complain. I spend a lot of time alone these days, and I usually eat vegetarian on those nights. I was hankering for a nice piece of beef. Like rib eye, not a filet (ew!). It was not to be, the rib eye did not make the menu this night. So I went with the Wood Grilled Loin of Grass-fed Lamb, Saffron Braised Potatoes, Green Onions, Pistachio, Pesto and Rosemary Scented Lamb jus. I do chops at home but not loin, and I enjoyed this beautiful cut of lamb. Everything on the plate was right. Scott ordered Smoked and Braised Short Ribs with Whole Grain Mustard Spaetzle, Sicilian Pickles, Quince Paste and Smoky Horseradish jus. The meat fell off the bones, and Scott requested I duplicate this at home. It was terrific, and the mustard spaetzle was so flavorful. I also ordered the Truffle-Parmigiano Fries because I just knew they would be good. I was right, and I seriously wanted to eat the entire plate of them. We relaxed a bit before dessert. Finished the wine of course, and ordered coffee. Scott ordered the Molten Chocolate Cake and I ordered the Fig Crostada. We happily munched away, and as I went to take a bite, Scott said, "I wouldn't stick that in your mouth just yet." Shut up....he was approaching our table! Yes, I met the famous Chef Chiarello. He is handsome and sweet and unassuming. Scott graciously took our photo and he chatted with us so easily. I told him if he opened a Napa Style in Nashville, it would need a little leather, but I would happily manage it! I am an even bigger fan! It was certainly an anniversary to remember! Next up, our last day in the valley. So first off, Happy Anniversary Baby! Today is 25 years of wedded bliss. So to celebrate, we did the wine country thing. We started in San Fran and dinner at Boulevard. Very good, the company was exceptional! The next day, a hike in Muir Woods with a few hundred of our closest (not) friends, and then to Sonoma. First meal was at a girl and a fig right on the historic Sonoma square. Delicious from top to bottom. Seasonal, beautiful, and we dined outside. So besides the annoying flies (which are everywhere) it was lovely. The next day was a biking adventure. Getaway Adventures was our tour operator. We met at the Napa River at 10 a.m. and biked, drank and ate until 5 p.m.
We hit Etude, Domaine Carneros, Madonna, Boon Fly Cafe and Adastra. We counted 24 tastings of wine and I seriously was ready to go home afterwards. And I mean home, like Tennessee. I was so over wine. But...nothing a good nights sleep can't help you shake. So back at it again, but this time in a car. We decided to head up to the Healdsberg and Geyersville area. We stumbled into a coffee shop along the Healdsberg square, and the young girl recommended Bella. Looking at the map this winery was way out, so off we went. 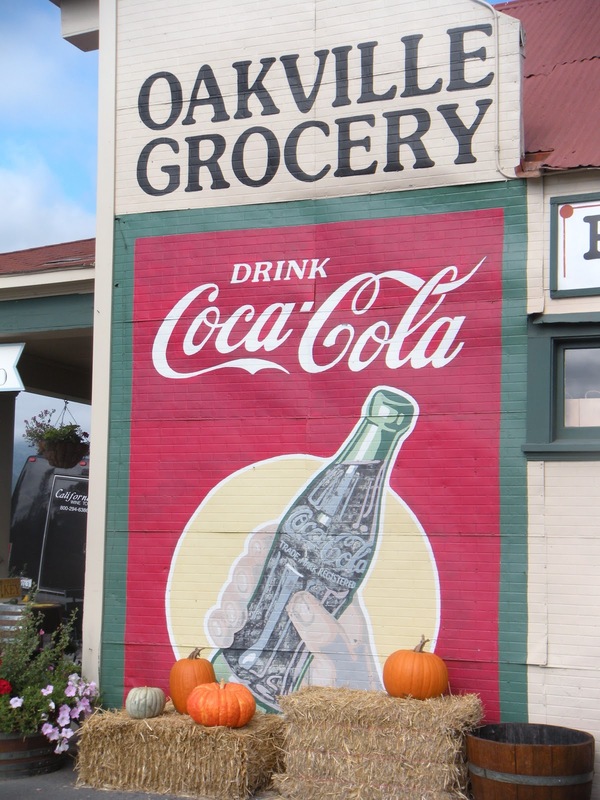 We first hit the Dry Creek General Store which was pretty cute. Then along the winding roads to Bella, which was the highlight of the trip. Charming and small, lots of bikers, great wine, charming caves, and the crush pad is right there and you could watch it in action. We could have spent hours at Bella, and wish we had picked up a lunch to picnic there. But then we would have missed Diavola. It is a pizzeria and salumeria on the "main street" in Geyserville. They start with a picardie glass of long, fresh made grissini. Oh my. We shared the roasted romaine salad with grilled shrimp, and our pizza was the Sonja. It was prosciutto (made there) marscapone, arugula and tomato. Delicious. On the table is an olive oil infused with hot Calabrian peppers, much tastier than crushed red pepper on a pizza. Then we ordered dessert. Scott had a root beer float with Salted Caramel Gelato and Brown Butter Gelato, Malted Chocolate Cookie and Caramelized Rice Crispies. The pastry chef recommends stout instead of root beer, but Scott wouldn't go there. He loved it with the root beer. I had Italian S'mores. Caramelized White Chocolate Gelato (an unnecessary component) Gianduja Chocolate, Hand Made Sambuca Marshmallows (be still my heart) and Hazelnut Cocoa Nib Short Bread. 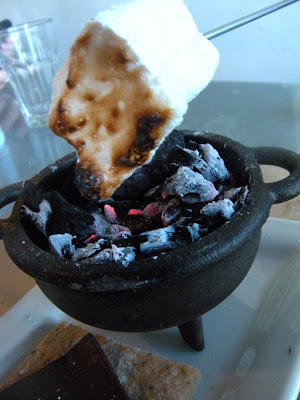 It came with a little cauldron of hot coals from the pizza oven to toast my marshmallows. I soooo loved this. I ate both of them. And to no one's surprise, I could not take another sip of wine all day. Which was fine, since we went to Frances Ford Coppola Winery. We affectionately called it the Disneyland Winery. I am glad we didn't miss it. It is a stunning place with a pool, cabanas, gorgeous setting and lots of movie memorabilia. It was fun to see the awards, the photos and there was even some stuff besides wine for sale. The wine is okay, but we weren't crazy about it. There are lots of people here. My favorite wine is the Sophia Prosecco in the little pink can. I am a total sucker for packaging, and I love a little sparkle but cannot drink an entire bottle on a whim. Then we drove and drove. It was stunning countryside and we mapped out the next day's adventures. I really wanted to see the petrified forest, but $32 for the two of us to walk in the woods was a little steep. I could get a nice Pinot for that! We stumbled upon the Culinary Institute of America, where I spent more time than anywhere else thus far, and Jimtown Store which to my dismay was closed. Okay, I admit, September and October, thus far, have been busy beyond belief, and contrary to what it may look like, we really do not eat cookies all the time. I am just throwing together soups and salads that are quick and not necessarily blog worthy. So today is the reveal day for the Secret Recipe Club, this is my second month in the group, and here we go with....cookies! I honestly wanted to make Orrechiette with Roasted Garlic Puttanesca, but I have been alone so much coming into this reveal, and then I had company but no time, so I opted to not do savory. 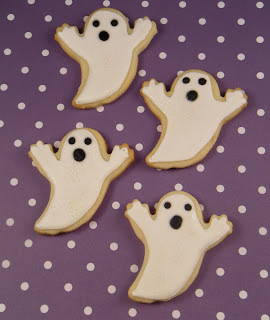 I am going to make that, one of these days, but today, I went cookie. Loaded Colossal Cookie! Not boring old sugar cookies like I make in my sleep. Cookies my college kids are going to LOVE! My blog assignment this month is Heavenly Treats and Treasures, and don't we sound like a perfect match! I was overwhelmed by how many things I wanted to make! Her bio is almost a mirror of my own. Southern mom, empty nester, mom is a great cook, loves to cook and bake. She even did a post about a William Sonoma product, the Emile Henry Pizza Stone, which she baked cookies on! What an idea, and I can do it with a discount! I think she is in Florida, but I am not sure. That is one thing about The Secret Club is you become a blog investigator, or blog creeper, depends on how you look at it! What caught my attention with this recipe was first the picture. It is a giant cookie baked in an iron skillet. How fun is that? Total Southern right there. It reminds me of those kitschy Southern restaurants where you drink out of Mason jars and dessert comes in cast iron. I had to do it. 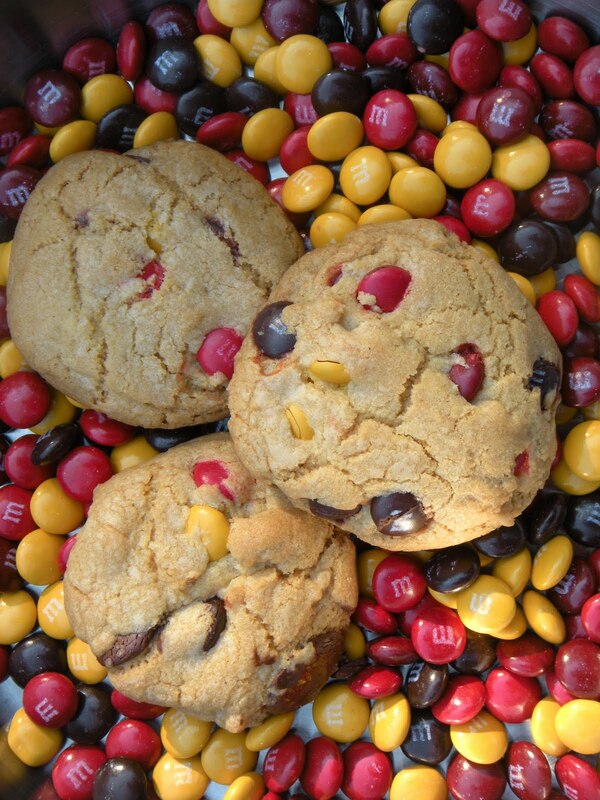 Especially since the recipe is adapted from Jacques Torres, and is called his Secret Recipe Cookies. I mean he is Mr. Chocolate after all. Then I continued to read, and the recipe makes 3 batches of dough which she recommends making each a little different with chocolate chips, nuts etc. I love this idea from top to bottom. She used milk chocolate with almond, dark chocolate and almond toffee. I knew I would drop in some Halloween M&Ms, I miss those holiday treats around the house. Actually, I miss the kids who eat those holiday treats, around the house. My empty nest, is, well, especially empty. I am one who cries at a good commercial, and this month everything is having that effect on me. Baking care package cookies is very good therapy. The recipe from her blog follows, but I hit a speed bump. I did indeed use the fall colored M&Ms, (which match my house perfectly, how Stepford is that?!) and I also had some leftover Guittard white chunks, and I threw in some bittersweet Guittard as well. So instead of 2 pounds I went more like 2½ pounds. My bad,ha, not bad at all! Then, I knew, buried in a cabinet, I had 2 cast iron pieces. It's been awhile, so as things are mixing I go and get my 12" skillet. Ah ha! I don't have one. I sell them. A lot of them. But I actually own a pot and a deep 8" skillet. (And frankly, they look pretty cruddy.) Not at all good for this. Then I remembered the summer clearance sale. I picked up a very cute copper tarte tatin pan. It is only 9", but like I said, cute. So I decided since Mr. Chocolate is French, it would work! I packed the dough in and popped it in the oven. 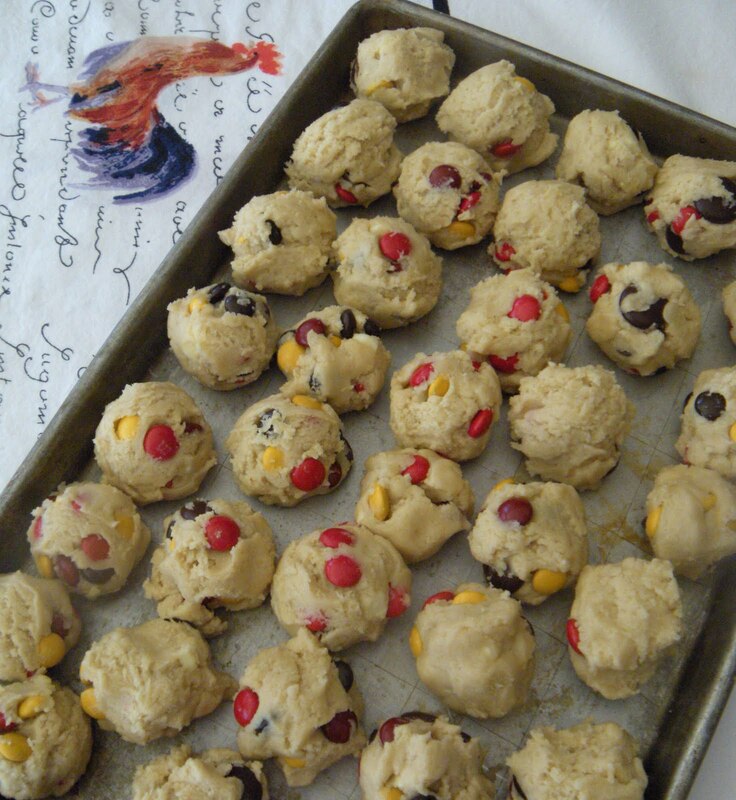 I made giant cookie balls out of the rest of the dough. I froze one tray of dough balls and then froze them in bags for future baking. Wouldn't my movie friends be excited if we were watching some great flick and I had cookies baking? One giant cookie for each? Great idea. Then I baked up a few cookies to mail to my favorite Oklahoma Sooner. 3 cups plus 2 tablespoons pastry flour* - the original recipe called for pastry flour, but I also didn't have any on hand so I followed her lead and substituted a blend of cake flour and all purpose flour, which approximates the protein/gluten ratio of pastry flour. To make 4 cups of pastry flour whisk 2 2/3 cups all purpose flour + 1 1/3 cups cake flour together. You'll have about 3/4 cup more than you need for this recipe, so save the remainder for another use. 2 pounds of high quality chocolate chips, wafers, or chunks - semisweet, milk, dark, or whatever combination you like. She recommends using Scharffen Berger, Callebaut, or Valrhona chocolate if you can get your hands on them. I concur, and I used Guittard. You know, discount. The first step was making her vanilla bean brown butter. This is new for me, but I love brown butter, and decided I needed to make this for the full effect. Here are the directions from her post. Cut each stick of one pound of unsalted butter into quarters. Add butter, 1 vanilla bean and the seeds to a medium saucepan. Heat on medium, stirring occasionally, until the butter turns golden and smells nutty. If will foam and then begin to clear when it is almost ready. Remove butter from the heat and cool it slightly. Remove the vanilla bean, then cover and place it in the fridge for about 20-30 minutes, until it's the consistency of softened butter. I browned the butter and then added Vanilla Paste. I think the effect will be similar and it works when there are no vanilla beans in the pantry! And let me tell you...when I took this out of the fridge and chopped it up to soften a little quicker, the aroma was amazing. I have a BIG idea for this...stay tuned. Preheat oven to 350 degrees F. Lightly grease a 12" cast iron skillet with canola oil. Or, if like me you only imagined you owned a cast iron skillet, grease a copper tarte tatin pan! In the bowl of your stand mixer, using the paddle attachment, cream the butter and sugars on medium speed. Add the eggs, one at a time, mixing well before adding each one. Add vanilla to the egg mixture and beat until well blended. In a separate bowl, whisk flours, baking powder, baking soda, and salt until well blended. Add 1/3 of flour mixture at a time to the batter, using an on/off pulsing motion until just about incorporated. After you add the last 1/3 of the flour, stop mixing just before it's all incorporated. Add the chocolate, a little at a time, mixing on low speed just until incorporated. Spread 1/3 of the dough into the prepared pan. Bake for about 25-30 minutes on the center rack, just until golden on the edges but still soft in the center. Don't over bake!! It will continue to bake in the skillet when you remove it from the oven. Cool on a baking rack for about 10 minutes. She offers a recipe for a caramel drizzle on her blog, but I opted not to use it, since I will be taking this to my daughter. And remember, there are 2 sections of dough left. Which means, a box for Nic and some frozen dough for an emergency! This was pure pleasure. I eat dough, not cookies, and this was tasty. Again, I was alone, so I had no one to taste the finished product before reveal. This is a keeper recipe, and I am going to hunt out some pastry flour to try it again. Many thanks to Heavenly Treats and Treasures, and I will be back some chilly fall night with her orecchiette. What are you waiting for? Get in there and bake! But first look around at the other reveals. As a footnote, I baked up a couple of cookies when my hubby returned (he looked everywhere for the colossal one, but it had already gone to college!) They were so delicious right out of the oven. That browned vanilla butter was delicious!